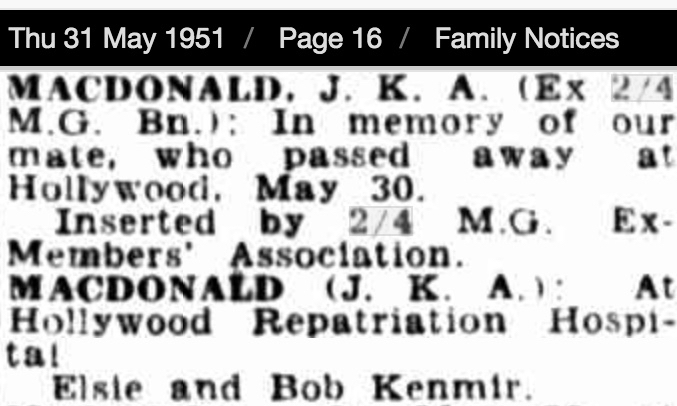 John MacDonald married in 1930 to Kathleen Nyland McNamara at Pemberton. At that time John was employed as a mill hand. His parents were residing at No. 8 Group Settlement, Pemberton. In 1936 John and Kathleen were residing at 20 Vivian St, Kalgoorlie and John employed as a miner. After the war, John returned to Kalgoorlie and with his wife Kathleen residing at 18 Vivian Street, and working as a miner. 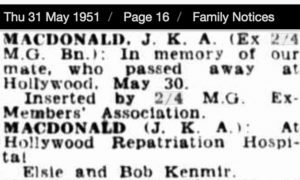 John died 30 May 1951, aged 43 years. Too young.